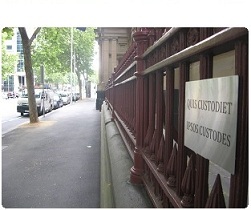 The Chief Justice of Victoria delivered a speech at the University of Melbourne on 1 May 2012 titled, Courts and Democracy - Just another Government Agency?. A variation of it was published as an opinion piece, No place for justice on a conveyor belt, in The Age last Thursday. Both built upon a previous theme of her speeches and writings, Does Judicial Independence Matter? In the Justice Department section of the recent state budget a heading appears, ''Dispensing Justice''. There follows a series of ''major outputs'', ''deliverables'' and ''performance measures'' laid down for the courts. The targets were not agreed by the Supreme Court and are misleading and meaningless. They are rejected as inappropriate. As part of its public accountability, the court sets targets and reports on its performance to Parliament. The court would always be prepared to discuss its performance with government, but targets cannot be set by Treasury. The targets equate the courts with a car factory. If the courts do not meet ''management's'' production-line target they will be penalised. The courts deliver justice and apply the rule of law. They do not ''produce'' cars, widgets or anything else. The portion of the budget the Chief Justice referred to is found in Chapter 2, here. The performance targets referred to can be found at pages 186 - 190. The Chief Justice's remarks got a decent run in last week's press, and a number of other judicial leaders, when asked, spoke in support of her observations. Nobody seemed inclined to have a go at Attorney-General Robert Clark. Rather, it seemed like faceless bureaucrats were the problem. I saw what she said and I understand exactly what she meant and fundamentally I agree with her. Her point is: courts have got to be efficient, courts have to account for the resources they get like any other institution of the State, but we are doing justice case by case, individual by individual, family by family, etc. That is a profoundly different thing, on our argument, and I agree with it, differently weighed and assessed and counted and evaluated, than making widgets. I agree with her, the Attorney isn't promoting that view of the world. It's a long-standing debate this - how do we describe and measure what we do as courts? It's a big issue. (If you want to jump to the interview without listening to the rest of Ross and John's morning show, the interview is around 2/3 of the way through the podcast. The Chief Magistrate's appearance was mainly about promoting Law Week). The current State government, when in opposition, promised the introduction of a Courts Executive Service to administer the courts. The exact form this body will take has yet to be announced. Thanks for posting the link to the budget document that Warren CJ was talking about. I think it's unfortunate that she didn't actually describe these 'measurables' in her article. (I haven't listened to her speech yet.) A reader could be left with the impression that the deliverables were things like 'lock up more rapists', 'simplify the law', or some such. Instead, the only two deliverables concern the number of matters heard in each court and the quality of registry services. I can't see why there's any issue at all with the latter, so the sole concern appears to be about setting a target number for matters heard. But I doubt that simply labelling all deliverables as 'inappropriate' and contrary to the independence of the courts (as if there aren't umpteen parts of the government that aren't also meant to be independent) is a good way of having such a discussion.